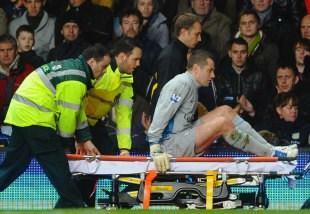 SHAY Given will be out of action for a month with a hamstring injury suffered in the 1-0 defeat to Man United at the weekend. He will be replaced by American Brad Guzan. Aston Villa manager Alex McLeish told the club website: “It is disappointing to lose Shay in such circumstances but, unfortunately, these things happen in football. “We have to meet these challenges and we will. We have total faith in Brad who, as I said after the game against Manchester United on Saturday, can be proud of the way he stepped in when Shay had to come off.